I was recently asked to speak this fall at the reunion for Albany High School’s Class of 1962. I’m totally honored to do so, and I think it will be a lot of fun. And while I was at it, I decided to add the 1973 film American Graffiti to my “Royale With Cheese Movie Club,” another film that everyone in the whole wide world has seen – everyone, that is, except me. One could easily argue that American Graffiti, along with the TV show Happy Days and the retro band Sha Na Na, did the most in altering our perception of what the late 1950’s-early 1960’s were like. I don’t think there were late night 15mph cruises up and down Central Avenue, or that everybody parked their ’59 Impala or ’61 Falcon all night at Kurver Kreme, before heading over to the Mohawk Drive-In. But watching American Graffiti does a great deal in reinforcing that perception. And if I can get past all the recognizable actors and get the image of their most memorable acting roles out of your mind – Richie Cunningham, Shirley Feeney, Han Solo, etc. – the film is pretty enjoyable. 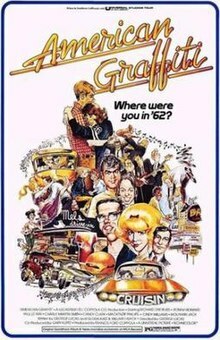 And if you get past all the classic cars in the film, you can see that American Graffiti is a film about what happens on that one final, magical night between your last regimented day of high school and your first day of self-determination. It’s love, it’s excitement, it’s action and it’s scintillating. If I did have to pick a scene in this movie that really captured my heat, it was when Richard Dreyfus’ character arrives at a radio station outside of town, hoping to meet the mysterious radio DJ Wolfman Jack. He runs into a radio station employee, and tries to pass a message to the mysterious girl in the white Thunderbird. The employee says he will refer the message to the Wolfman – and it’s only as they part, does he realize that he handed the message to the legendary Wolfman Jack himself. As a former disc jockey and radio personality myself, that scene in the movie was poignant. And think about this for a moment. Probably before 1977, this motion picture was what George Lucas was best known for. “The man who made American Graffiti” were some of the advertising points to the early showings of Star Wars. Hard to believe. Okay. So now I’m ready for the 1962 Albany High School 50th anniversary reunion. But I’m telling you… if I happen to see a dreamy long-haired blonde in a white Thunderbird drive by… I might need to take a break from speaking that night. Wink. I am pleasantly surprised/pleased by the post – It’s obviously on the calendar to remind yourself of upcoming dates/events and plan accordingly-so thanks for the 3 month countdown and “pr work”. You will be wined and dined for sure! Grandway was the Impala, Hemi, etal scene.